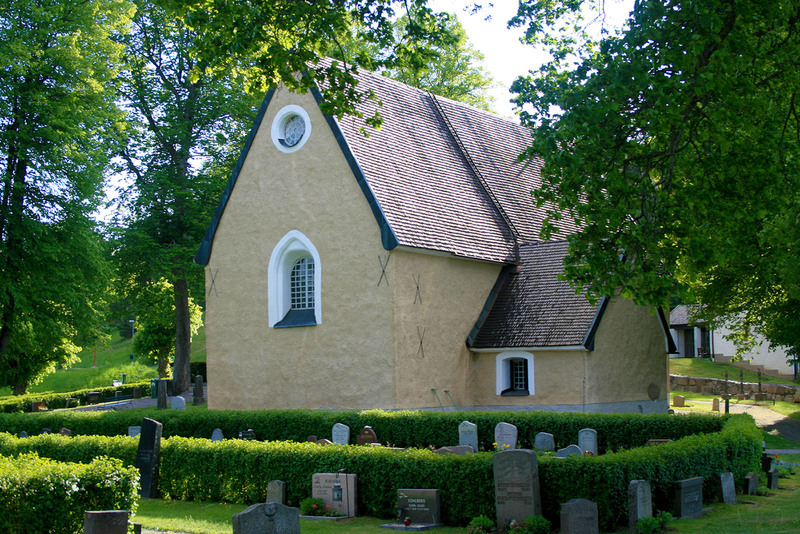 Hammarby Church is a plastered stone church with a steep pitched roof clad in wooden shingles. The nave is oriented to east-west with a rectangular plan somewhat irregular on the west end. A sacristy is built on the north side and porch on the south. The western part of the nave is probably part of the nave to a smaller Romanesque church dating from about 1200’s. In the 1300’s the church was expanded east when the vestry was added. The vaults in the Romanesque portion were added around the year 1400. Around that time, the old wooden porch was replaced with the current stone structure. In 1678 the eastern most arch in the nave collapsed and was rebuilt the same year. Hammarby Church is one of the few medieval churches that never had window openings on the northern walls. This church probably replaced an earlier wooden church on the location.